Matthias Erzberger (20 September 1875 – 26 August 1921) was a German publicist and politician, Reich Minister of Finance from 1919 to 1920. Prominent in the Catholic Centre Party, he spoke out against World War I from 1917 and as authorized representative of the Reich government signed the armistice between Germany and the Allies. He was assassinated for this act by the right-wing terrorist group Organisation Consul. He was born on 20 September 1875 in Buttenhausen (today part of Münsingen) in the Kingdom of Württemberg, the son of Josef Erzberger (1847-1907), a tailor and postman, and his wife Katherina (née Flad; 1845-1916). In his early life he gained massive weight, which he lost in the course of thirty years. He attended the seminaries in Schwäbisch Hall and Bad Saulgau, where he graduated in 1894, and started a career as a primary school (Volksschule) teacher. While teaching, he also studied constitutional law and economics at Fribourg, Switzerland. Two years later, he became a journalist working for the Catholic Centre party's publication Deutsches Volksblatt in Stuttgart, where he also worked as a freelance writer. Erzberger joined the Catholic Centre Party and was first elected to the German Reichstag in 1903 for Biberach. By virtue of unusually varied political activities, he took a leading position in the parliamentary party. He became a specialist in colonial policy and financial policy, contributing to the financial reforms of 1909. In 1912, Erzberger became a member of the Fraktionsführung, the leadership of the parliamentary party. He supported a significant military build-up in Germany in the years 1912-13. In 1900, he married Paula Eberhard, daughter of a businessman, in Rottenburg. They had three children (a son and two daughters). Like many others in his party, he initially supported Germany's involvement in World War I and was carried along by a wave of nationalistic enthusiasm. In September 1914, he wrote a memorandum in which he laid out his view on Germany's war aims, advocating the annexation of Belgium and parts of Lorraine, among other territories. By this stage he was rapporteur to the Reichstag's Military Affairs Committee, and the "right-hand man" of the Chancellor Theobald von Bethmann-Hollweg. He was in charge of foreign propaganda, especially relating to Catholic groups, and set up a system of information gathering using the resources of the Holy See and of the Freemasons. Erzberger was also involved in some diplomatic missions. For example, he worked with Bernhard von Bülow in a failed attempt to keep Italy from entering the war in 1915. He wrote letters to leading military authorities, later published, with extravagant plans for German annexations. Seen as an opportunist, he was said to have "no convictions, but only appetites". Erzberger contributed to bring about the fall of Bethmann-Hollweg in the summer of 1917, hoping to have him replaced with Bülow. Instead, Georg Michaelis, the nominee of Erich Ludendorff whose position in the Oberste Heeresleitung (High Command) made him virtually a dictator, became chancellor. By 1917, with the armies stalemated on both fronts, Erzberger changed his political stance. He became one of the leading opponents of unrestricted submarine warfare and in April 1917, he met a Russian envoy in Stockholm to discuss peace terms. He elucidated his views on the war in a speech in the Reichstag on 6 July in which he called on the government to denounce territorial ambitions and conclude a negotiated end to the war. The speech was remarkable at the time in that he carefully delineated the extent of German military weakness. Two weeks later, on 19 July, he put to the vote what he called a "peace resolution," which embodied all the points he had made in his speech. The resolution passed 212 to 126. It received the support of Chancellor Michaelis, who had hamstrung the resolution by adding to his support the proviso "as I interpret it," which he then used as an excuse to ignore it. That July, at a closed conference in Frankfurt, Erzberger revealed the content of a pessimistic secret report from Austria-Hungary's Foreign Minister, Count Czernin, to Austrian Emperor Karl. This report came into the possession of the Allies. Although it has never been proven that Erzberger was responsible, the extreme right now saw him as a traitor to his country. The restructuring of the War Office was deemed vital to moderating extreme militarism. One of the successes was the Budget Committee of the Reichstag, which Erzberger used successfully to navigate the Auxiliary Service Bill into law. On 25, 27, and 28 November, he spoke with eloquence and passion on modernising the administration. He won widespread socialist support for trying to protect the civil rights of citizens to the Bundesrat: it was an important victory for civilian lawmakers. However, General Wilhelm Groener's dismissal had brought a crisis: Erzberger took advantage of Bauer's military conversations on 10 and 19 June to be his own man. On 6 July the devastating attack on unrestricted submarine warfare had radicalised the socialists in the Reichstag and precipitated the shift in foreign policy. With Ebert's oratory he galvanised moderate opponents of the 'war party' to pacify the starving workers. The intrigues undermined Bethmann-Hollweg's government, dividing the Chancellor from the Reichstag. The coalition of 9 July was disruptive but a principled defence of factory workers rights; he had been expected to be a willing tool of Oberste Heeresleitung, content to propagandize. Instead, the outspoken demagogue had earnt the lasting enmity of the Cabinet, particularly the militarists, who now ruled Germany. The advance of a manhood suffrage bill precipitated the Chancellor's downfall, but without it, a socialist revolution would be even more certain. That failure and Ludendorff's refusal to support the War Minister triggered his resignation and another crisis. Still, warning about big business pressure for profit-taking masked the real collapse in domestic confidence, which Erzberger longed to pin on reactionary industrialists. In March 1918, Erzberger was the most influential supporter in government of the candidacy of Wilhelm, Duke of Urach, for the proposed throne of the stillborn Kingdom of Lithuania. Both were Catholics from Württemberg. He tabled a question in the Reichstag on 3 March to Groener on whether a memorandum had been prepared for the reform of the War Contracting System. Erzberger's political attempts at peace failed, but his public attack on the war effort and dissemination of information about the fragility of the German military created a climate in which the government found it increasingly difficult to maintain the belief that the war could be won. When, towards the end of the war, the German Navy mutinied at Kiel, the sailors informed their officers that what they wanted was "Erzberger", by then synonymous with "peace." Painting depicting the signature of the armistice in the railway carriage. Behind the table, from right to left, general Weygand, Marshal Foch (standing) and British Admiral Rosslyn Wemyss and fourth from the left, British Naval Captain Jack Marriott. In the foreground, Erzberger, Major General Detlof von Winterfeldt (with helmet), Alfred von Oberndorff and Ernst Vanselow. On 3 October 1918, Erzberger entered the government of Prince Maximilian von Baden as a Secretary of State without a specified portfolio. On 6 November 1918, a reluctant Erzberger was sent to negotiate with the Allies in the Forest of Compiègne. :73 Prince Maximilian supposed that Erzberger, as a Catholic civilian, would be more acceptable to the allies than a Prussian military officer; in addition, he believed that Erzberger's reputation as a man of peace was unassailable. As the head of the German delegation, he signed the armistice ending World War I on 11 November 1918 at Compiègne with French representative Ferdinand Foch. He made a short speech on the occasion, protesting the harshness of the terms, and concluded by saying that "a nation of seventy millions can suffer, but it cannot die." Foch ignored Erzberger's attempt to shake his hand and is said to have replied, "Très bien" ("very well"). Returning to Berlin, Erzberger agreed to serve under Ebert as Chairman of the Armistice Commission, a difficult and humiliating task. He fell out with Ulrich von Brockdorff-Rantzau, first Foreign Minister of the Weimar Republic, in early 1919 for advocating the handing over of Karl Radek, the Bolshevik diplomat and agitator, to the Entente following the collapse of the German Revolution. After the elections for the Weimar National Assembly in January 1919, Erzberger entered the government of the German Republic led by Philipp Scheidemann, again as minister without a specified portfolio, but responsible for matters relating to the armistice. 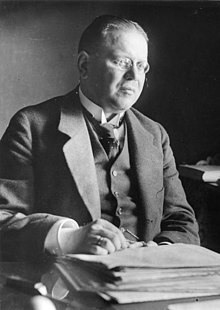 When Scheidemann resigned over the harsh terms of Treaty of Versailles and a new government led by Gustav Bauer took over on 21 June 1919, Erzberger became finance minister and vice chancellor. After the Weimar Constitution came into force in August 1919, Erzberger remained in that position. He supported the Treaty of Versailles, as he saw no military or political alternatives. He was treated with particular contempt by the nationalist right wing as the man who had signed what was coming to be viewed as a humiliating and unnecessary surrender. However, he succeeded in pushing new taxation measures through the National Assembly. In July 1919, Erzberger introduced what became known as "Erzberger finance reform." The reform pursued two goals. First, it was to give the German federal government supreme authority to tax and spend and thus end the dependence of the central government on the constituent states, as in the former German Empire. Second, Erzberger aimed for a significant redistribution of the tax burden in favour of low- to moderate income households. In July 1919, Kriegsabgaben (war levies) on income and wealth were introduced, as well as the first German inheritance tax. :23 In December 1919, an additional Reichsnotopfer (a one-time "emergency" tax on wealth) was levied, causing outrage among the better-off. In March 1920, a federal income tax followed. Its high tax rates made Erzberger even more unpopular with many on the right. The German tax code still bears Erzberger's imprint. He stabilized national finances, although they remained strained by the burden of reparations. He also reformed and unified the previously independent state railway administrations into the German Reichsbahn, which began to make a profit for the first time and helped pay the war reparations. In his disputes with the political right, Erzberger set himself in particularly sharp opposition to the German National People's Party (the old conservatives), on whom he laid the responsibility for the war; the result was a personal dispute with the leader of the Nationalists, the war-time Secretary of State for the Treasury, Karl Helfferich, who published a brochure titled "Fort mit Erzberger!" ("Get rid of Erzberger! "), and Erzberger was ultimately compelled to bring an action against Helfferich for slander. The case was heard in a Berlin court from 19 January to 12 March 1920. The action resulted in a small fine for Helfferich (German law did not make provision for any damages or penalties for slander). The court, however, in its judgment of 12 March 1920, took the line that Helfferich's allegations regarding Erzberger's corrupt business practices and untruthful statements were partly justified. Erzberger was consequently compelled by his party to resign his ministerial office and to give up his seat in the National Assembly in March 1920. During the trial, an attempt was made upon Erzberger's life as he was leaving the court that left him rather seriously wounded. Erzberger was once more returned to the Reichstag (which replaced the National Assembly) at the general election of June 1920, but in accordance with the wish of his party, he abstained from immediate participation in politics, as proceedings had been instituted against him on a charge of evading taxation. In 1920, he published a memorandum endeavouring to justify his position during the war, and he followed it up with disclosures regarding the attitude of the Holy See in 1917 and the mission of the papal legate in Munich, Eugenio Pacelli (later Pope Pius XII. Erzberger's power in German politics was based on his great influence with the Catholic working classes in the Rhineland, Westphalia, central Germany and Silesia. In the industrial regions of these districts, the Catholic workers were organized in their own trade unions on lines of very advanced social policy, and Erzberger became the leading exponent of their views in the Reichstag and on public platforms. On the other hand, he incurred the strong opposition of the conservative and landed section of the Catholics, some of the higher clergy such Cardinal Archbishop Felix von Hartmann of Cologne, and the Bavarian agricultural interests as represented by the Bavarian Catholic People's Party in the State Diet at Munich and in the Reichstag in Berlin. Erzberger continued to be pursued by the relentless animosity of the reactionary parties, the conservatives and the national liberals of the German People's Party. This hostility, which amounted to a vendetta, was based not so much upon Erzberger's foreign policy — his negotiation of the Armistice terms and the decisive influence which he exercised in securing the acceptance of the Treaty of Versailles — as upon his financial policies. He was suspect for his activities as finance minister in 1919, as the supporter of liberal Catholic trade unions and, it was said, as political adviser of the Catholic Chancellor of the Reich, Joseph Wirth, who prepared a fresh scheme of taxation designed to impose new burdens upon capital and upon the prosperous landed interests in the summer of 1921. Erzberger's birthplace in Buttenhausen is now a small museum. The denunciations of the conservative and national liberal press went beyond the ordinary limits of party polemics: the Tägliche Rundschau observed, in allusion to Erzberger's personal appearance, “he may be as round as a bullet, but he is not bullet-proof.” The climax of these attacks was that Erzberger was murdered on 26 August 1921 in Bad Griesbach, a spa in the Black Forest (Baden) while he was out for a walk. Due to his signing the armistice of 1918, Erzberger was regarded as a traitor by many on the political right. Manfred von Killinger, a leading member of the Germanenorden, masterminded his killing by recruiting two members of the ultra-nationalist death squad Organisation Consul: Heinrich Tillessen and Heinrich Schulz. Both were former Navy officers and members of the disbanded Marinebrigade Ehrhardt. Erzberger's assassins were later smuggled into Hungary and were prosecuted only after World War II. His funeral turned into a political rally, at which one of the speakers was Joseph Wirth. Erzberger is buried in the Catholic cemetery of Biberach an der Riss. Erzberger was instrumental in preparing the German nation for peace and in ensuring that the Catholic Centre Party, the predecessors of today's Christian Democratic Union, retained a modicum of power in an increasingly radicalized Germany. His financial, federal and rail reforms transformed Germany. Erzberger, with his optimism and sense of responsibility, never retreated even in the face of the most difficult tasks. In fact his greatest, and most tragic legacy, was the signature on the Armistice. This, despite the fact that the military was actively pressuring him to sign as soon as possible, was pointed out for decades afterwards as evidence for the Dolchstoßlegende (stab-in-the-back myth), under which the surrender was betrayed by the civilians on the home front, especially Socialist politicians for personal gain, undermining the German Army's will to fight. Later the stab-in-the-back legend helped to propel to power Adolf Hitler who made it an integral part of Nazi propaganda. For his role, Erzberger was branded as one of the Novemberverbrecher ("November Criminals"). ^ a b c d e f g h i j k l m n o p q r s t "Matthias Erzberger 1875-1921" (in German). LeMO (Living virtual Museum Online) - DHM. Retrieved 25 October 2015. ^ a b c d e f g h i j k l m n "Deutsche Biographie: Matthias Erzberger" (in German). Bayerische Staatsbibliothek (BSB). Retrieved 25 October 2015. ^ a b c d e f g h i j k l Chisholm, Hugh, ed. (1922). "Erzberger, Matthias" . Encyclopædia Britannica (12th ed.). London & New York. ^ Tuchman, Barbara Wertheim (1980). August 1914. London: Papermac. pp. 314–316. ISBN 0333305167. Original edition: Tuchman, Barbara W. (1962). The Guns of August. New York: Macmillan. ^ Essay by Sergej von Cube, Annaberger Annalen, 8, 2000 (in German). ^ a b Haffner, Sebastian (2002). Die deutsche Revolution 1918/19 (in German). Kindler. ISBN 3-463-40423-0. ^ a b Sturm, Reinhard (2011). "Weimarer Republik, Informationen zur politischen Bildung, Nr. 261 (German)". Bonn: Bundeszentrale für politische Bildung. ISSN 0046-9408. Retrieved 17 June 2013. ^ "Chronik 1919" (in German). LeMO (Living virtual Museum Online) - DHM. Retrieved 25 October 2015. ^ "Innenpolitik" (in German). LeMO (Living virtual Museum Online) - DHM. Retrieved 25 October 2015. ^ Szejnmann 1999, p. 38. ^ Winkler 1998, p. 178. Diemer, Kurt (1986). Matthias Erzberger (1875–1921). Staatsmann und Demokrat. Biberach: Biberacher Verlagsdruckerei. ISBN 3-924489-36-X. Dowe, Christopher (2011). Matthias Erzberger. Ein Leben für die Demokratie. Stuttgart: Verlag W. Kohlhammer Verlag. ISBN 978-3-17-021491-0. Dowe, Christopher (2011). Die Kamera als politische Waffe? : Matthias Erzberger im Fokus der Pressefotografen. Heidelberg: Stiftung Reichspräsident-Friedrich-Ebert-Gedenkstätte. ISBN 978-3-928880-34-3. Eschenburg, Theodor (1973). Matthias Erzberger. Der grosse Mann des Parliamentarismus und der Finanzreform. München: Piper Verlag. ISBN 3-492-00339-7. Epstein, Klaus (1959). Matthias Erzberger and the dilemma of German democracy. Princeton: Princeton University Press. der Geschichte Baden-Württemberg, Haus, ed. (2013). Matthias Erzberger. Ein Demokrat in Zeiten des Hasses. Karlsruhe: G. Braun Buchverlag. ISBN 978-3-765-08436-2. Heinzelmann, Josef (1969). "Zur Herkunft Matthias Erzbergers". Genealogie. 18: 593–604. Krausnick, Michael; Randecker, Günter (2005). Mord Erzberger! Konkursverwalter des Kaiserreichs und Wegbereiter der Demokratie. Norderstedt: Books on Demand. ISBN 3-8334-3586-0. Leitzbach, Christian; Erzberger, Matthias (1998). Ein kritischer Beobachter des Wilhelminischen Reiches 1895–1914. Frankfurt am Main: Europäischer Verlag der Wissenschaften GmbH. ISBN 3-631-33492-3. Michalka, Wolfgang, ed. (2002). Matthias Erzberger: Reichsminister in Deutschlands schwerster Zeit. Potsdam: Verlag für Berlin-Brandenburg. ISBN 3-935035-32-2. Szejnmann, Claus-Christian W. (1999). Nazism in Central Germany: The Brownshirts in 'Red' Saxony. New York: Berghahn Books. ISBN 1-57181-942-8. Retrieved 25 October 2015. Winkler, Heinrich August (1998). La Repubblica di Weimar: 1918-1933: storia della prima democrazia tedesca (in Italian). Rome: Donzelli. ISBN 88-7989-428-5. Retrieved 25 October 2015. This page was last edited on 12 December 2018, at 18:25 (UTC).